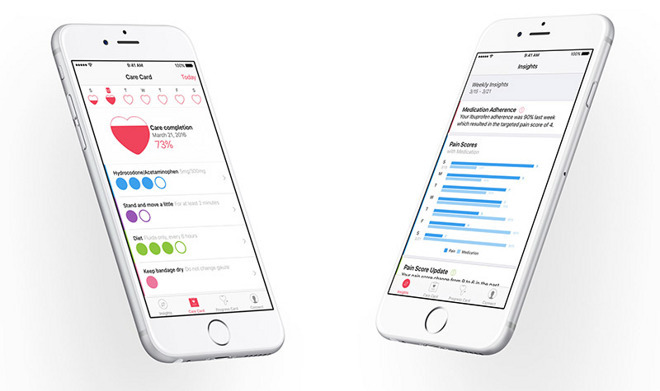 Apple on Thursday flipped the switch on its new CareKit framework, a health-minded platform that lets developers build advanced software solutions for tracking, managing and reporting medical conditions. Announced in March, CareKit is an open-source tool similar in function to Apple's ResearchKit, but on a much smaller scale. Instead of nationwide medical studies, CareKit is designed to facilitate the secure collection of user health data, either for personal use or sharing with healthcare professionals. According to TechCrunch, the launch is limited to four apps geared toward iPhone users: fertility tracker Glow Nurture; maternity app Glow Baby; diabetes monitoring app One Drop; and depression medication tracker Start. Apple is also making CareKit available on GitHub starting today. Developers using CareKit are able to integrate four key interactive modules into their apps. First up is the Care Card, which can be configured to manage wellness tasks like medication consumption and exercise. The Progress Card contains a Symptom and Measurement tracker for logging physical indicators like pain levels, hunger and heart rate, the latter of which might be integrated with Apple Watch. Care Card and Progress Card data can be viewed and compared in the Insight Dashboard module. Finally, the Connect module lets users share their health data with medical practitioners. CareKit is also compliant with major healthcare records systems, including Epic, making it easy to securely share personal health data with a number of supporting hospitals and doctors.